This stylish jumper is built for comfort and warmth. With a pretty slogan design that makes it on trend too. The white colour can be paired with a variety of outfits and it’s slightly larger fit so it’s easy to layer on the cold Winter days. 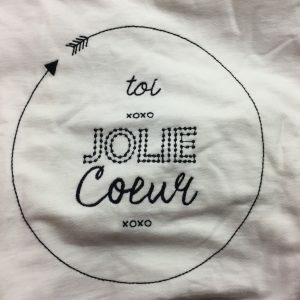 The French ‘toi Jolie Coeur’ translates to ‘your pretty heart’ which I think is totally adorable. 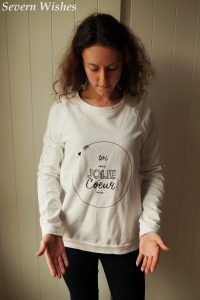 It’s a soft material and I love the details of the stitching, the circle is an arrow in a neverending design, with xoxo and the French words in two different fonts, its an unusual design that I fell in love with when I saw it. Personally I live in skinny jeans, which work well with jumpers of all sorts. This particular one has nice long sleeves which I do prefer, and even if a jumper is a little baggy like this one appears on my shape, it’s better for layering in my opinion. I would wear this piece around the house with lazy clothing or for going out I would dress it up with bootcut jeans and high heeled boots. Quality; I found the quality of this jumper to be good, it’s soft and washed well. However my only issue is that it creases very easily while being worn. Something to be aware of if ironing isn’t something you have a lot of time for. Once effort is made with this piece though it’s a lovely addition to most peoples wardrobes. I love the thick cotton material because it’s both soft and durable. Value for Money; I had a discount code sent by email for this on a special weekend event, so I got a percentage off the price. I felt that this discount made the jumper a more affordable price, without it though I will be honest, I probably wouldn’t have made the purchase. Appearance; Both stylish and on trend, I think this jumper will be a staple in my wardrobe. I hope the condition of the jumper will remain through frequent washes. 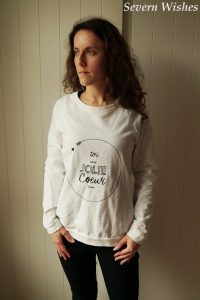 Comfort; This item is both soft and comfortable to wear, and I find the fit a little bit large but that is how I prefer my jumpers so that I can layer underneath them. I chose the size above what I would choose for a t-shirt and the jumper fits perfectly around my shoulders and neckline. Thank you very much for reading this review, I have thoroughly enjoyed sharing my thoughts about this new jumper with you all. I really enjoy the clothing from Dorothy Perkins, I have so many purchases that I don’t even share with you, so if you enjoy reading about them please leave me a comment, and expect more reviews to come. I hope you have enjoyed this post. If you have any questions about the item then please feel free to leave me a comment. I would leave a link to the item but it seems to have been taken off the website now, I presume they have sold out! However there are so many jumper variations of similar shape available. I still recommend a look. This entry was posted in Clothing, Dorothy Perkins, Reviews by Sabrina. Bookmark the permalink.